Mr Macmillan ordered the plan withheld even from British chiefs of staff, because of their tendency “to chatter”. Driving the call for action was the CIA’s Middle East chief Kermit Roosevelt, grandson of former president Theodore Roosevelt. Kermit Roosevelt had a proven track record in this sort of thing. According to the New York Times, he was the leader of the CIA’s coup in Iran in 1953, which – as subsequently admitted by the CIA – used false flag terror to topple the democratically elected leader or Iran. Is it purely coincidence that the U.S. has heavily armed Al Qaeda Muslim extremists in Syria (and see this), and trained the jihadis who later became ISIS? Regime change in Syria was not a once-off plan. Neoconservatives also planned regime change in Syria more than 20 years ago … in 1991. 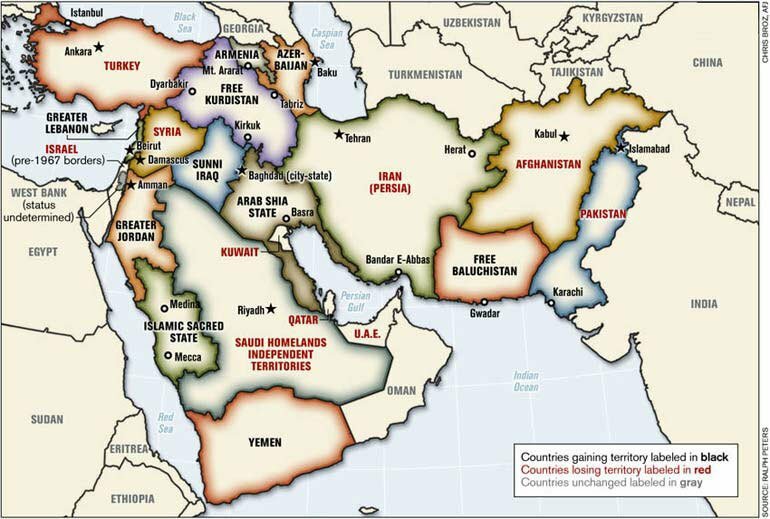 The Western powers agreed 100 years ago to arbitrarily divvy up the Middle East, without regard for historical boundries. Neooconservatives in the U.S. and Israel have long advocated for the balkanization of Syria into smaller regions based on ethnicity and religion. All the Arab states should be broken down, by Israel, into small units …. Dissolution of Syria and Iraq later on into ethnically or religiously unique areas such as in Lebanon, is Israel’s primary target on the Eastern front in the long run.